Kanwal’s Healthy Corner – I ♥ Hazelnut Truffles! Last year on Valentine’s Day, my mom called in the evening. She said ‘You didn’t call to say Happy Valentine’s Day to me’. 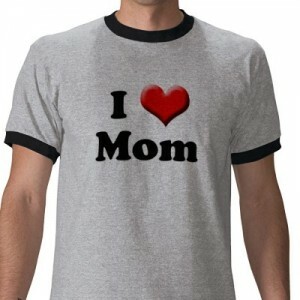 It suddenly occurred to me, for every year that I can think of, I’ve always called my mom and have said ‘Happy Valentine’s Day!’ to her on February 14th. I don’t know why I missed the one year to say it to my mom, but I realized that Valentine’s Day is not just for partners, boyfriend, girlfriend, husband or wife. No, to me Valentine’s Day is just another day to express your love to ANYONE you love! I personally believe that you do not need to pay special attention to one day out of the year to display your love for others. However, this day does allow those who do not express their love too often, to display their affection. So, ladies and gentlemen, remember, Valentine’s Day is not just for you and your significant other; let your family and friends know just how much you appreciate them in your life! OK, so why not show your loved ones how much you care about them by making them a box of hazelnut truffles for Valentine’s Day?! Pour the heavy cream into a large bowl and add the chocolate chips and hazelnut extract. Carefully microwave this for 30 seconds, and then stir. Microwave again for 15 seconds, and then stir again to incorporate the chips and cream. If needed, continue to microwave on 10 second intervals and stir until the chocolate and cream become one. Once done, place bowl in the refrigerator for 2 hours to harden. Remove bowl from the refrigerator and allow to slightly thaw on the counter for 10 minutes. In the meantime, place your truffle coatings onto separate plates, to easily roll the truffles in. With a tablespoon, scoop out a small ball of chocolate and quickly form into a small ball. These do not have to be perfect. 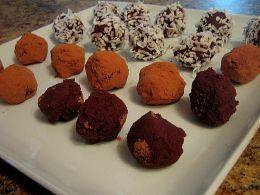 In fact, chocolate truffles get their name to resemble the truffles that grow in the ground! Once the ball is formed, roll in one of the coatings. Repeat this process and continue to coat in different coatings. This entry was posted on Wednesday, February 10th, 2010 at 9:43 am and is filed under Uncategorized. Oh yum! These sound almost too good, Kanwal. I’d have to give them away immediately, or run the risk of eating them all, tee hee. Thank you so much for sharing this recipe. And I agree, Valentine’s Day is not just for couples. I once sent my mom roses, and she was very touched.